Matcha in vacuum-sealed packs, bamboo matcha spoon and whisk © Wise Tea Garden Classic Matcha is a green or white tea that has been ground to a powder (a pulverized tea) since the 15th century. Matcha teas have high fiber content, is high in protein and antioxidants. They make excellent lattes, a terrific addition to smoothies, can be used in desserts and chocolate making. 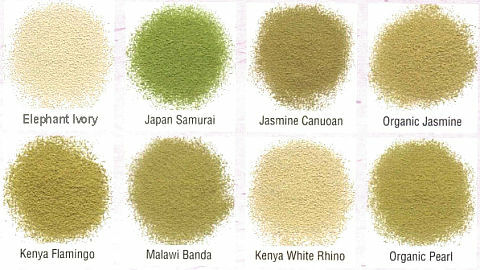 All varieties of Matcha we sell are processed from raw tea converted into Matcha at a factory in Canada on traditional authentic Japanese equipment. Kenya Matcha teas are grown on tea estates that have the following certifications: Fair Trade, Rain Forest Alliance, UTZ, ISO and HACCP. No pesticides or herbicides used and there is zero fear of any radioactive contamination. Along with classic Matchas made of Camellia sinensis, we also inventory Herbal Matchas grounded from Rooibos, Yerba Mate, and other herbs. Our Organic Matcha Teas are packed at a HACCP certified facility and have certifications of CFIA COR (Canadian Organic Regime), USDA NOP, and/or EU Organic Farmers and Growers (OF&G). Also, all teas, including organic must be able to pass the CFIA, USFDA or EFSA certifications. Products of Canada. Fair Trade and Ethical Partnership certified. Canadian Food Safe guarantee. In strict accordance with NOP/CO/EU guidelines, organic tea products never come in contact with non-organic teas or any other prohibited substances. NOP/CO/EU certification is extremely rigorous but with it, when the product states Organic, you know it's organic! Status within the program is audited annually. Matcha shelf life: 6-8 years, after opening: it is good for 2 years, but for the vacuum fresh benefit, use within 3 months. Consuming: One cup of Matcha is equivalent to consuming 3 cups of Green Tea. Matcha teas have lots of caffeine and minerals that may keep you awake. The best time for Matcha is morning and early afternoon. Do not overdose. When consuming matcha you actually consume all the tea leaves. Scientific testing in Japan has indicated that on account of this fact the antioxidant benefit of matcha can be up to 5-9 greater then with normal green tea consumed in the conventional manner. Matchas made from high altitude teas such as Kenya Green or Kenya White tea, have some of the highest antioxidant levels recorded for tea - considerably more than Japan Green tea. 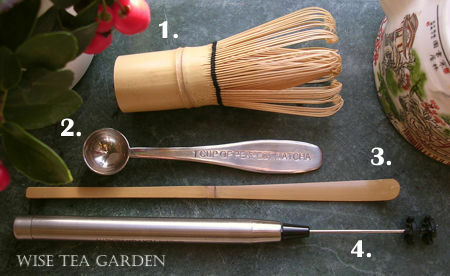 CEREMONIAL MATCHA (guidelines of the Cha no yu ceremony) you will need a set of Japanese tea ceremony tools: Bowls, scoops, and a whisk. Prepare tea bowls by warming them with boiled water. Prepare your Matcha whisk by soaking the tip in the boiled water in one of the bowls for about 10 seconds. Pour the water out and dry the bowl with a paper towel. Using your teaspoon, add 2 scoops of Matcha to each bowl. Pour 1/3 of a cup of your hot water into each bowl. In a slow "m" motion, submerge any loose bits of Matcha that may be floating on the surface of the tea. Whisk the tea more briskly in a back and forth motion until the surface of the Matcha becomes frothy. Consume immediately. In Japan, it is customary to drink the entire bowl in 3 quick slurps. Care: Hand wash with backing soda. 4. ELECTRONIC MATCHA WHISK: Grade 18/8 stainless steel. Electric motor (2 x AAA batteries are not included - buy rechargeable). After each use, remove batteries. Care: Hand wash under running water. To wash the whole whisk, remove the batteries prior washing.  Our Matcha Teas are sold in nitrogen-flushed vacuum-sealed 200g packs only (7oz, 0.44 lbs).  Store in the original packaging: gently squeeze out the air, put in the plastic bag and fasten using a rubber band. Refrigerate. Organic Certificates: Certified to the standards of the USDA/NOP, COR (Canadian Organic) and EU (European Organic) programs by SAI Global Certification Services Pty Ltd. (Canada); Lab-test: Guelph University, Ontario; Shelf Life: 8 years unopened, 3 months after opening. Raw Tea Origin: Kericho and Nandi Highlands, Packed in Canada. Naturally grown, with no pesticides or herbicides used. Altitude: 6500 ft above sea level, Antioxidant Level: Super High, Caffeine Content: Low. The tea used to make this innovative Kenyan Matcha is grown at high altitude under bright sun and as such is packed full of antioxidants, polyphenols and exceptionally crisp flavor. Only the youngest leaves are plucked, processed and carefully ground using a traditional stone mill to an exceptionally smooth consistency. The resulting cup is thick and rich with wonderfully warm mossy notes of grass and slight floral undertones of oolong. 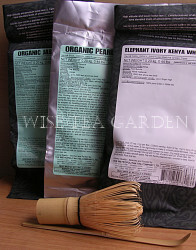 Ingredients: Luxury Natural Kenya White Tea (White Tips and Pai Mu Tan) + Luxury Natural Kenya Sencha Green Tea. Cup characteristics: Crisp and flavory, yet smooth. Infusion: Pale tending greenish. Raw Tea Origin: Jiangxi Province, Packed in Canada. Certified Organic: USDA/NOP, COR (Canadian Organic) and EU (European Organic) programs by SAI Global Certification Services Pty Ltd. (Canada). 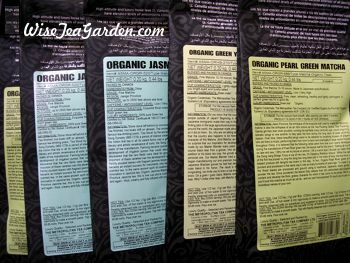 Ingredients: 100% Certified Organic Green Tea, Certified Organic Jasmine Blossoms. Cup characteristics: Stone ground using an exceptional scented Jiangxi Province Jasmine tea, this is an exceptional, thick, creamy and fully infused Matcha with sweet exquisite jasmine floral notes. Infusion: Tending bright emerald green. Raw Tea Origin: China, Jiangxi Province, Packed in Canada. Antioxidant Level: Very High, Caffeine Content: Low. Certified Organic: USDA/NOP, COR (Canadian Organic) and EU (European Organic) programs by SAI Global Certification Services Pty Ltd. (Canada). Jianxi Province is the birthplace of the exquisite leaf used to make this fabulous Matcha. In fact, Organic Pearl River green is still plucked and processed in the same way it was so many hundreds of years ago. To make it, only the finest leaves are processed and ground using a traditional Japanese stone grinder to powder the tea. Once powdered, the leaves fully release their rich antioxidant and polyphenol content and develop the thick, grassy character for which it has come to be prized. Ingredients: 100% Certified Organic Green Tea. Cup characteristics: Pure, clean, refreshing, healthy and lightly astringent. A perfect green tea for a good life. Infusion: Tending dark forest green. Grade: Fine Matcha 10-16 micron. Made to Japanese specifications. Growing Attitude: 5500-6500 feet above sea level. Manufacture Type: Traditional Matcha process, Small batch crafted, 100% Natural. Ingredients: Luxury Natural White Tea (White Tips and Pai Mu Tan) + Luxury Natural Full Leaf Kenya Sencha Green Tea. Cup Characteristics: The resulting cup is thick and rich with wonderfully warm mossy notes of grass and slight floral undertones of oolong. Exquisite flavory tea notes that are classic to luxury White Kenya Tea. Crisp and flavory, yet smooth. Infusion: Pale tending greenish. Raw Tea Origin: Kenya, Nandi Highlands. Packed in Canada. Growing Attitude: 5500-6500 feet above sea level. Manufacture Type: Traditional Matcha process, Small batch crafted, 100% Natural. Kenya ranks as one of the most bio-diverse countries on the planet. This is the home of countless species of flowers, more than 80 species of land animals, and literally thousands of species of birds. One of the most famous of these is the flamingo. Ingredients: Luxury Natural Green Tea. Cup Characteristics: Superb tea flavor with hints of light honey and white flower background. Infusion: Tending dark green with golden highlights. Raw Tea Origin: Kenya, Nandi Highlands. Packed in Canada. Growing Attitude: 5500-6500 feet above sea level. Manufacture Type: Traditional Matcha process, Small batch crafted, 100% Natural. The tea is made by grinding a rich, full leaf black Kenyan tea, selected for its tannins and antioxidant count, using a Japanese style Matcha mill. Craft-ground in small quantities only, Kenya Black Matcha dazzles the palette with smooth, malty notes balanced by a pleasingly smooth astringency. When brewing this incredible tea, we would suggest to experiment with amounts, water temperatures, and whisking duration until you find the strength that is perfect for you. Cup Characteristics: Smooth tea taste with some astringency. Add sugar and milk to open delightful malty notes. Infusion: Tending deep coppery orange. Antioxidant Level: Low (Rooibos does not contain Epigallocatechin Gallate - a Camellia Sinensis (Tea) polyphenol), Caffeine Content: Caffeine Free Herb. Growing Altitudes: 1500-2500 feet above sea level. Manufacture Type: Traditional Matcha process, small batch crafted, 100% Natural. According to the South African Rooibos council, by that time, the plant had captured the attention of a noted medical doctor named Dr. Le Fras Nortier. He began researching Rooibos' medicinal value and studying its feasibility as an agricultural crop. Thankfully, his research and innovative outlook paid off, and Rooibos began life as a commercial crop in the 1930s. By 1984, Rooibos tea was making news in Japan where natural health practitioners believed it had anti-aging properties. Ingredients: 100% Certified Organic Rooibos. Cup Characteristics: Smooth with bitter chocolate notes. Infusion: Burnt orange. Antioxidant Level: Medium / Very High. Growing Altitudes: 1500-3000 feet above sea level. The country of Brazil has the largest population of Japanese people outside of Japan. Naturally, as with all immigrants to countries around the world, the Japanese made almost as much of an imprint on their adopted homeland as it did on them. Now, Brazil is the country also happens to be home to the fabulous Mate, which was used to create this Matcha tea. Ingredients: 100% Certified Organic Green Mate. Cup Characteristics: Lightly vegetative with notes of walnut and toast. Infusion: Tending emerald green. MATCHA - 200g PACKS © WISE TEA GARDEN®  ULTRA ROOIBOS ©wiseteagarden.com: combine 5-10ml Organic Green Pearl matcha (or 1 perfect matcha spoon) and 30-50ml of hot water, mix vigorously to make a paste-like substance. Top with freshly-brewed Organic Green Rooibos. Enjoy a perfect drinking vitamin-C liquid for long Canadian winter!  HALLOWEEN MUFFINS ©wiseteagarden.com: Organic Zombie Flesh Muffins - simply add 30-45 ml of Organic Green Matcha to the organic flour mixture in your recipe. The more the greener, but do not overdose Matcha, otherwise your muffins will have an unpleasant bitter taste. For more effect - put a few pieces of freeze-dried Raspberry between two layers of dough in each baking cup, and voilà! Tip: One fresh raspberry makes more 'bloody' effect. Dried Gojiberry, Prunes, Pumpkin seeds and shredded Carrot can be a delicious extra.  MATCHA LATTÉ: Use 1/2 tsp. (1g) per 8oz. (225ml) serving. Add 1/2 tsp. (1g) to base of cup and add 2oz. of hot water. Mix vigorously to make a smooth paste-like liquid. Top with freshly steamed milk or a substitute and sweeten to taste. Optional: Maple syrup or honey.  THE PERFECT MATCHA LATTÉ: Combine 1 level teaspoon of matcha, 15oz/425ml of milk, and 1oz/28.3ml flavoured syrup into a 16oz/453ml stainless carafe. Stir well, breaking up any clumps. Froth using espresso machine frothing wand.  ICED MATCHA LATTÉ: Use 1/2 tsp. (1g) per 8oz. (225ml) serving. Add 1/2 tsp. (1g) to base of cup and add 2oz. of hot water. Mix vigorously to make a smooth paste-like liquid. Top with freshly steamed milk or a substitute and sweeten to taste. Cool for 30-60 minutes and pour over ice.  SLOW BREWED ICED MATCHA: Place 3 level teaspoons of Matcha into a glass pitcher. Fill pitcher with ice and let sit. After a few hours, ice will have melted and tea brewed. Stir vigorously to ensure the Matcha goes into suspension. Pour over ice.  MATCHA GINGER TEA WITH CRUSHED ICE AND LIME: Use 2 level teaspoons of Matcha, 2 tablespoons of chopped ginger, 1/2 cup ice, juice of 1/2 lime, dash of honey. Blend ice, Matcha and ginger in a blender until ice is crushed. Pour into a chilled glass. Add lime juice and honey.  SIMPLE HOT MATCHA: Bring filtered or freshly drawn water to a rolling boil and let cool to roughly 180F/82C. Place approximately of a teaspoon of Matcha in your cup. Infuse with 8oz/250ml of water, whisk briskly.